← Demystifying Architectural Character – what style is this? The new home of the Oklahoma City University School of Law is the second renovation of what was once Central High School in Oklahoma City and was designed by FSB architects engineers planners. The historic building originally designed in 1909 is considered Collegiate Gothic style and is a work of art through the detailing created by skilled artisan laborers that carved the limestone, laid the mosaic tile and tooled the elaborate plaster. The building, however, contains artwork created by a little known Oklahoma artist that was born in Prague. The daughter of Czech immigrants, Olinka Hrdy was born in 1902 in a one-room sod house and was described as petite, with dark features and a soft voice. She went on to attend the University of Oklahoma as an art student where she earned tuition money by painting murals in faculty offices and dining halls. While on his honeymoon in Norman, Bruce Goff noticed Hrdy’s work in the dining hall and after meeting her invited her to paint murals in a project he was designing in Tulsa; Riverside Studio. 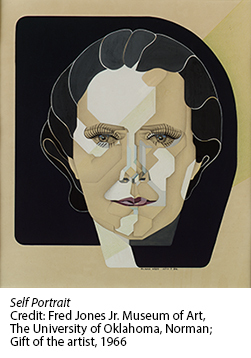 She was later invited to paint murals for Frank Lloyd Wright. 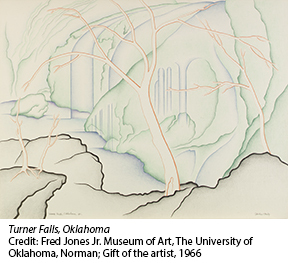 In 1964, she gave most of her works to the OU Fred Jones Jr. Museum which represented only half of her work, the remainder having been lost or destroyed. She spent her later years in Prague and in1987 died at the age of 85 in her mother’s home. Olinka Hrdy remains largely unknown. Only 2 of Hrdy’s murals remain; the one at the former Central High School in Oklahoma City and one at Will Rogers Middle School in Long Beach, California. The following is an excerpt from an interview with Ms. Hrdy. Credit: Oral history interview with Olinka Hrdy, 1965 Mar. 13-Mar. 17, Archives of American Art, Smithsonian Institution. BH: This is Betty Lockrie Hoag on March 13, 1965, interviewing the artist Olinka Hrdy in her studio in Woodland Hills, Los Angeles. Miss Hrdy was active in the Federal Art Project in Los Angeles and is going to tell us some very interesting things about it but before we get to that period which the archives are especially interested in I want to ask you something about your own life, would you like to tell us where you were born and when? OH: I was born about a mile and a half of a little Czechoslovakian settlement in Prague, Oklahoma, P-R-A-G-U-E that is about 53 miles east of Oklahoma City. I was born in this little sod hut. BH: Oh, you’re a soddy. OH: I guess that’s what I am. BH: My father-in-law’s a soddy too. I understand that they have a very close kinship. BH: You probably had a wonderful time. OH: Oh I certainly was, it was one of the highlights of my life. Well after I graduated I was given a commission to do a couple of murals in Oklahoma City at a high school there. This is one of the photographs, as you see that is in line too. BH: Was this with Mr. Goff? OH: That was before I went to Tulsa. BH: Its the same technique as the other one you’d done. OH: You see its getting a little more mature. By that time I knew a little bit more about art. This is a color sketch but that was, oh what was that eleven feet by fifteen. There were two, the buildings I say was Greek and so I did the two murals on either side of the entrance way to the auditorium and one decoration was the development of the mind showing music, painting, and sculpture with acropolis in the background. And the other decoration on the other side was the development of the body showing the discus thrower, the javelin thrower and the runner I believe. BH: What room was it in the auditorium did you say? OH: That was in the entrance way leading to the auditorium. BH: And is that still there? OH: I imagine it is. I don’t have much time to go around and pick up photographs of all these things but you can find out if they’re there. But I don’t have photographs of all these things but to give you some idea. BH: Did that take you about a year to do? OH: No it only took me the summer. I did those two during the summer and in the beginning of the year I went to Tulsa where I began doing the murals with Bruce Goff. The 2 panel mural, Development of the Mind and Development of the Body each 8 feet by 9 feet have held up over the years considering that they are still in existence, however, they were in immediate need of repair and protection. The mural is actually a painting on canvas which was then adhered to the wall. 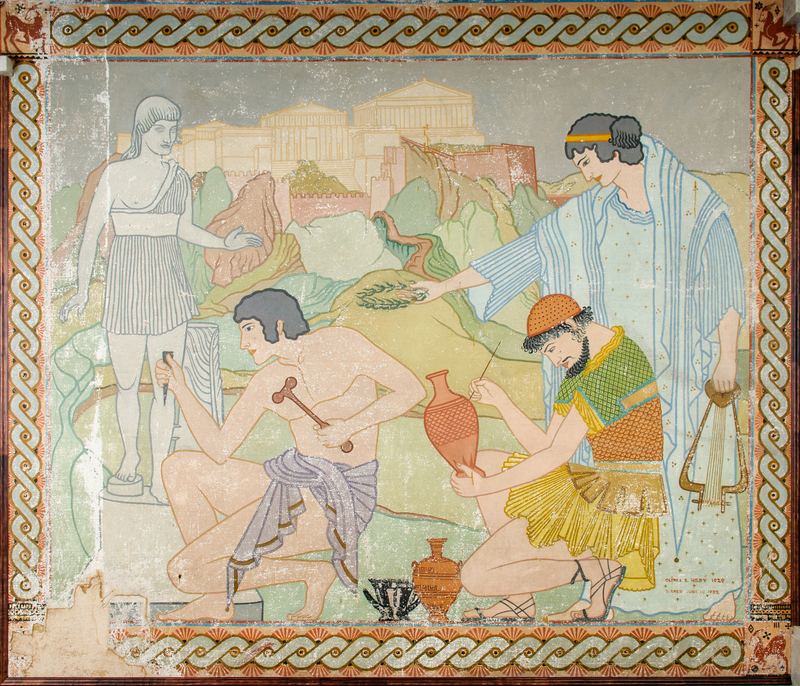 The mural caught the notice of Lee Peoples, professor and director of the law library which led to the OCU School of Law taking on the task of restoring the art work. 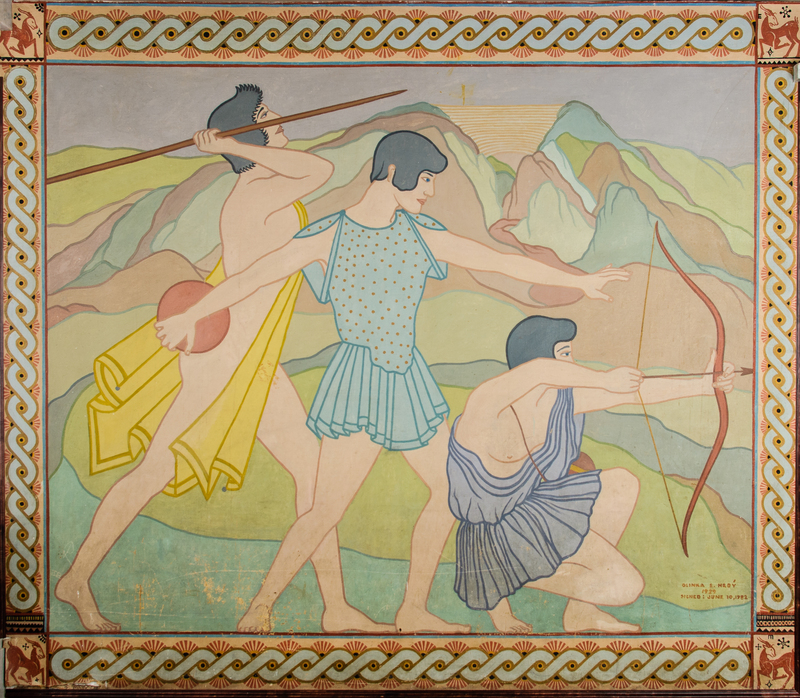 The mural has been painstakingly removed by professionals from the Western Center for the Conservation of the Arts located in Denver, Colorado where they will be fully restored and returned for reinstallation to be on display for public viewing.